Pune-based Byond Tech has launched a 6-inch dual-SIM smartphone-tablet hybrid in the country. Dubbed as the Phablet PIII, the device is priced at Rs. 14,999 and is now available across India. At 11.3mm thickness, the Phablet PIII features a 6-inch FWVGA high resolution 5-point touch capacitive display (854X480 pixels) and comes with Android 4.1.1 Jelly Bean straight out of the box. The phablet features an 8-megapixel rear snapper with LED flash and a VGA front-facing camera as well. Underneath the Phablet PIII is powered by a 1GHz dual-core processor and has expandable storage options of up to 32GB via microSD card. It comes with a 2,500mAH battery. There aren't any details available for the RAM or internal storage as of now. The device supports dual-SIM (GSM+GSM) dual standby functionality and boasts connectivity options like WiFi 802.11 b/g/n, 3G and Bluetooth 2.0. Karbonn comes closest to this device with its A30 Ta - Fone, which has also just been launched. The A30 sports a 5.9-inch capacitive touch display with 480x800 pixels and runs on Android 4.0. Other features include an 8-megapixel auto focus camera with LED flash. 1.3-megapixel front-facing camera, 1GHz dual-core processor, 4GB of internal storage, dual-SIM support (3G+2G) and 2,500mAh battery. 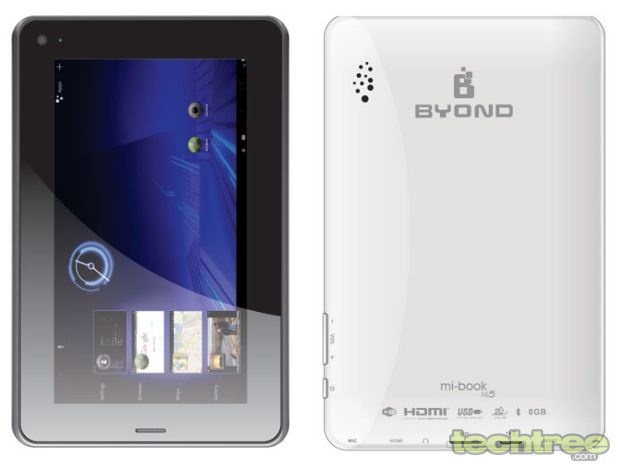 Back in October, Byond had launched 3D-based Android tablets with 7-inch, 9-inch and 10-inch screens priced between Rs. 4,300 and Rs. 11,000. The company is eyeing to sell over one lakh smart phones per month by launching new range in lower price bracket and targeting Rs. 400 crore turnover from smart phones and tablets in 2013-14. Byond is looking at launching Android-powered mobile handsets across 3.5-6-inch screens priced between Rs. 4,000 - Rs. 13,000.